In a homage to my post about Why Designers HATE Comic Sans, I am going to go and look at another member of the design worlds reviled font’s collection. Seriously folks, I swear this font was BORN to be loathed by designers everywhere. It’s incredibly tacky in a horrible kitschy way and it should never be used anywhere, certainly not in professional production pieces (Avatar, I am looking at you here). And if the Avatar clue hadn’t given it away already, Ladies and Gentlemen for your delectable Hatred, I present to you, the Font PAPYRUS. God, You could not pick out a worse font if you tried. 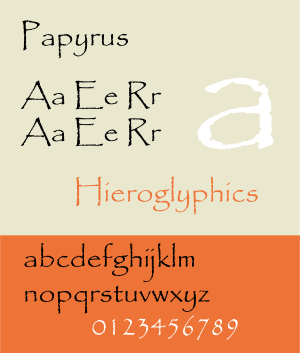 Papyrus. Look at that wonderful example of the kind of font that is used by people with no design sense. Now in my post on Comic Sans, I at least managed to say that Comic Sans has it’s uses and can be quite effective if it’s used properly in the right places. And it does suffer from over use, But Papyrus here is another classic example of an overused font, but unlike Comic Sans, this font doesn’t have any use. Overly Tacky, Gimmicky, a Single use font that you see on the signs of Hippy Shops and in places trying to seem “Cool” and “Well designed”. I see this in your logo, I don’t enter your shop. So let’s get down to brass tacks and tell you something about this font. This particular Font face was designed in 1982 by Chris Costello, (who himself admits that Papyrus is overused). It was designed to mix the distinctive characteristics of Roman Characters with the drawn look of beautiful calligraphy. And it does both of those things rather well. But while it might be a well designed font, it is not a good font at all. And if anything it’s almost as overused as Comic Sans. It has this attraction to churches and yoga/women’s health clubs as well as Hippy and Health Stores. Please people, consign this font to the bin of life, we don’t need to see more of it in use. “But while it might be a well designed font, it is not a good font at all.” Tell me more. I keep reading that it is badly designed or a ‘bad font’, but there are never any specifics. Right now, the only thing I can find is that it is disliked just because the ‘cool kids’ have decided that they hate it. The problem I have with papyrus is similar to that of comic sans. It’s an over used kitschy font that is frequently used in massively inappropriate places. Every font has its usage places, and I will happily bow to the fact that even the most reviled of fonts, Comic Sans has it’s own place and can come into its own in the right circumstances, but that is just it. in the right circumstances. Papyrus itself isn’t badly designed (as I said in the article). It’s just overused. Even Helvetica is now becoming a font to dislike because of its overuse and it’s ‘hipster’ status of being the greatest font of all. Usage is always key when looking at fonts. Pick something that works for your brand, business and image. Welcome to the Musings of Dave. This blog (for want of a better word) is simply a little outlet I use for some of my thoughts. Generally the ones I want to share with people anyway! Be prepared for lots of cynicism, some humor and a LOT of coffee!